First time I saw the book of Junko’s at Mbak R’s house, I thought how on earth could you make that. Then I saw it again on her blog. She never failed to amaze me again and again. And I can sense her contribution in this month’s challenge because all of a sudden we have to make this. But if it’s not because I had to I don’t think I would make it. Was already threatened by the complicated look of it. At first when reading the recipe, immediately gotten a headache. Needed more than 3 times to read the recipe to finally get where everything goes and when. The cake was typical Asian cake, very moist and soft. Somehow I find the filling of whipped cream and mandarine oranges complemented the taste and texture of the cake. Will I make it again? If it was not that complicated I might. Hehehe. 1. 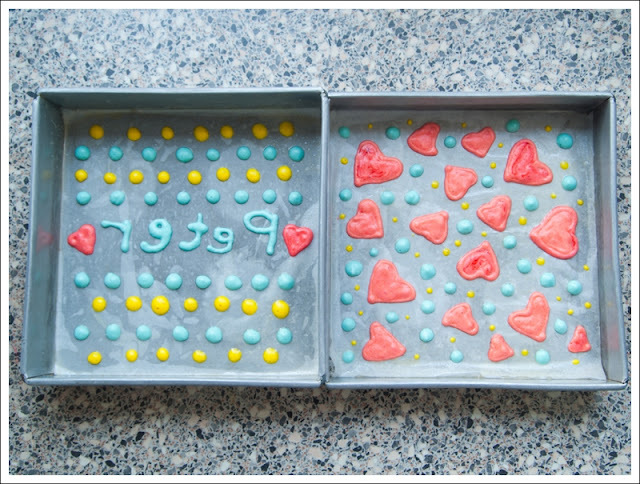 Cut two 9×9 greaseproof paper and draw patterns on each of them. (I didn’t do this, I just did it free handedly). Lightly grease the baking pans, then place the greaseproof paper on the baking pan. Then lightly grease the greaseproof paper. Preheat oven to 165-175C. 2. Prepare batter 1: in a medium or large bowl, beat together yolks and sugar on high speed until thick and pale. Add oil and beat on medium-low speed until blended. With the mixer still on medium-low, add water and mix thoroughly. Lastly, add flour and mix until just combined. 3. 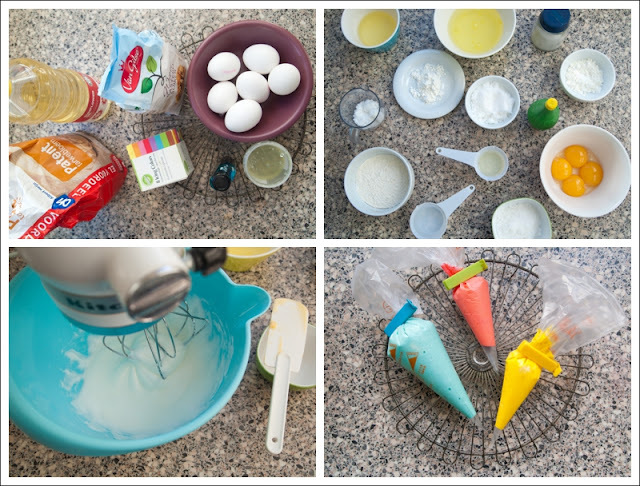 Rinse beaters and prepare batter 2: Beat egg whites and caster sugar until soft peaks form. Add cornstarch and beat until mixed throughly. 4. Add 5-6 Tbsp of batter 1 into batter 2. Add food colouring, or divide batters into any number of colours you wish to use and colour them differently. Then start painting on your greaseproof paper. Place painted pan in the freezer. 5. Prepare batter 3: beat egg whites, salt, caster sugar, and lemon juice until soft peak forms. Mix in cornstarch.Mix batter 3 with remaining of batter 1. If you want to colour the cake, add in food colouring now. Mix with a metal spoon a few times to lighten the batter, then add the rest of batter 3. Mix lightly until just combined. 6. Take pan out of freezer. Pour batter and spread evenly. Bake 20-25 minutes or until toothpick test comes out clean. Cool on pan for 5 minutes, then invert onto another baking paper. Peel baking paper and discard. 7. When the cake has cooled, prepare filling. I used whipped cream with mandarine oranges. Spread filling evenly, then roll, using the baking paper as guide. Serve.